Every December for as long as I remember, all the ladies in my family bake special Christmas biscuits or bredele. This tradition comes from Alsace, the region in east of France on the border with Germany where my family has roots. It is an important part of getting in the festive mood to prepare biscuits and this Christmas is no exception! This year, I am turning for the first time my favorite biscuits into gluten free versions, starting with the delicious Leckerli. There are dozens of types of bredele, that come in all kinds of shapes and flavors, such as almond, lemon, chocolate, hazelnut or coconut. 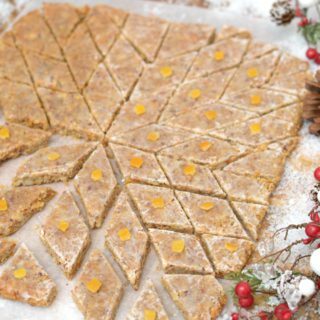 Leckerli is a soft type of biscuit made of almonds, hazelnuts, honey and candied citrus peel. Leckerli are originally from Switzerland, however the version we do in my family differs slightly in terms of ingredients and texture. Among other things, we use egg yolks and very little flour comparing to the traditional Swiss recipe. Not only the biscuits are turning out nicely moist (purist will claim that Leckerli must be hard), but they also are easy to adapt to a gluten free version, yey! I planned originally to use store-bought candied orange and lemon peels, as we do every year. However I eventually decided to make candied orange and lemon peels by myself, using exclusively honey. The candied peels turned out much more fragrant, on top of being healthier than their off-the-shelf version. Now baking Leckerlis requires a bit of patience. The dough needs to rest overnight or even several days, if you manage to resist to urge to taste them as quickly as possible! Also once baked it is recommended to wait couple of days before eating them – oh well, no one can wait so long, right? Leckerli are perfect for sharing during all the Christmas time and beyond. Now let’s start baking! 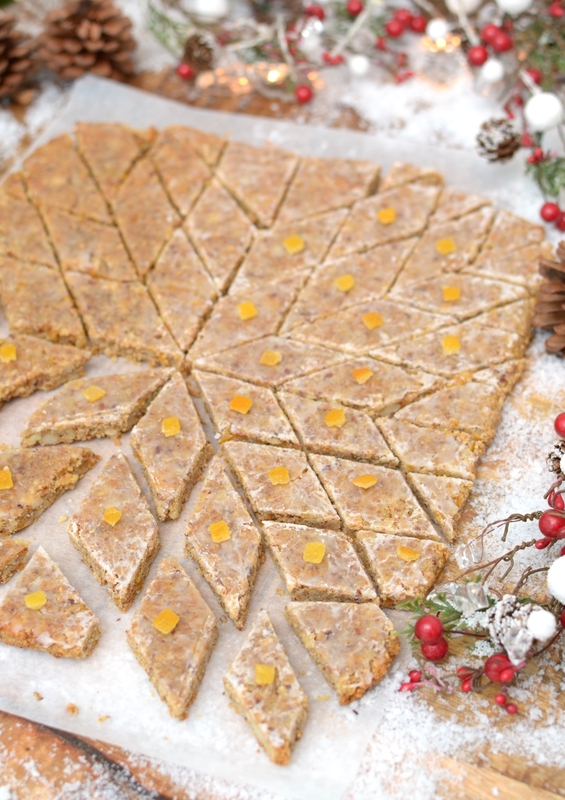 Flavorful gluten free Leckerli biscuits made of almonds, hazelnuts, honey and homemade candied citrus peel. Rinse the oranges and the lemon. Cut the peel off the oranges and the lemon in long strips. Cut in tiny bite sizes (about 2 mm). Place in a saucepan with water and bring to boil. Drain and do it once more, to remove bitterness. Put the peel bits back to the saucepan, add water so the peels are just covered, then add the honey. Cook until the syrup thickens, about 20 minutes (add a little extra water half way if needed). In the meanwhile, in a large bowl, mix the almonds, hazelnuts, coconut sugar, flour and cinnamon. Add the candied orange and lemon rind along with the syrup. Whisk the egg yolks until stiff and add to the mixture. Stir until well combined. The next day: take the dough out of the fridge half an hour before working on it. Preheat the oven 180 degrees. Spread the dough on parchment paper, about 1 cm thick. Make a glazing with icing sugar and few drops of water (or Kirsch), and brush it right away on the warm biscuit. On a work surface, using a large, sharp knife, trim the edges then cut into square or diamond shape. Keep the biscuits in an airtight container or a metal box. They can be stored for several weeks. 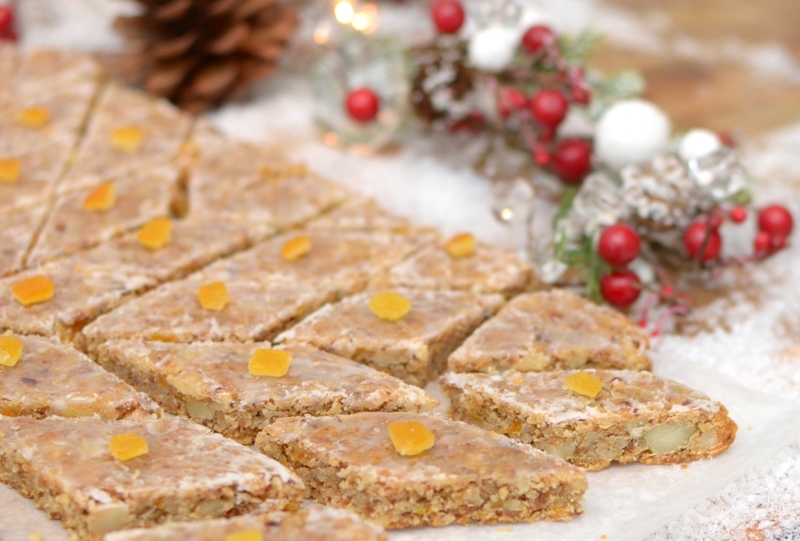 Leckerli sans gluten aux amandes, noisettes, cannelle et citron et orange confits, l'un des incontournables biscuits de noël! Faire les fruits confits (passer cette étape si vous les achetez tous prêts): Rinser les oranges et citrons. Prélever en rubans les zestes sans entamer la chair. Couper en petits morceaux (environ 2 mm). Placer dans une casserole avec de l'eau et porter à ébullition. Egouter et recommencer, le but est d'ôter l'amertume. Remettre les morceaux dans la casserole, ajouter de l'eau pour qu'ils soient juste recouverts, puis ajouter le miel. Cuire jusqu'à ce que le sirop épaississe (environ 20 min). Pendant ce temps, mélanger dans un bol les amandes, noisettes, le sucre de coco, la farine et la cannelle. Ajouter les oranges et citrons confits. Battre les blancs d'oeufs en neige et ajouter au mélange jusqu'à ce que le tout soit bien homogène. Couvrir de film et réfrigérer pour une nuit. Le lendemain, sortir la pâte du réfrigérateur uen demi heure avant de l'utiliser. Étaler la pâte sur du papier surfurisé, l'épaisseur est d'environ 1 cm. Faire un glaçage en mélangeant du sucre glace et quelques gouttes d'eau (ou de kirsch) et étaler sur les biscuits encore chauds. Avec un couteau bien aiguisé, couper les bords irréguliers du biscuit puis découper des formes en carré ou en losange. Conserver les biscuits dans un récipient hermétique ou une boite en fer blanc.